Dry frying is a great way to prepare tofu. It removes the moisture from the tofu, enabling it to soak up the flavors of a marinade or sauce. Rather than the often soggy texture and bland flavor of tofu, you will have created firm sponges that will take on flavors beautifully. You will use firm or extra-firm tofu. If you're going to dry fry, extra-firm tofu is the best choice as it will hold its shape better and brown better during dry frying. Do not use silken tofu for this technique. The two main tricks to dry frying tofu are to make sure the tofu is well drained (also called pressing tofu) and to use a non-stick pan. You will not be using any oil when frying, and you will need to cook it very slowly so it browns without sticking. Here are easy instructions showing how to dry fry tofu. It takes about 10 minutes to dry fry 3/4 pound of extra-firm tofu cut into 16 triangles. For equipment, you will use a non-stick pan or well-seasoned cast-iron skillet and a stovetop burner. You will need a strainer and a spatula. Drain 3/4 to 1 pound of tofu, pressing it to drain thoroughly. While the tofu is draining, prepare a marinade or sauce for the dish you are going to cook using the tofu. Cut the tofu into triangular pieces about 1/2 inch thick. 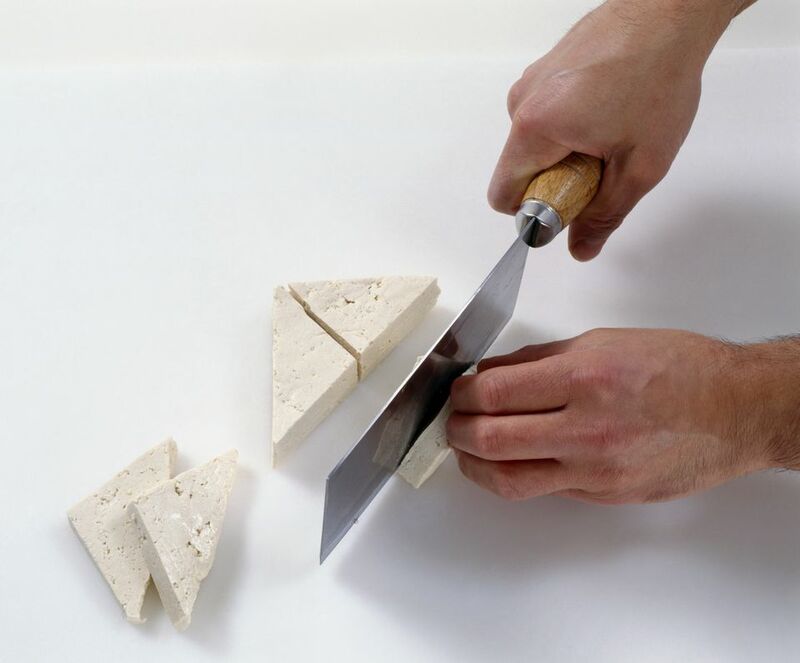 You can also cut the tofu into cubes but, you will find that triangles are the easiest shape with which to work. Place the tofu triangles in a non-stick frying pan over medium heat, making sure they are laid out flat. They should also be well separated and not touching. If your pan is too small to allow this, cook them in batches. Cook the tofu until it is golden brown, pressing down firmly on the tofu triangles with a spatula during cooking. You will hear hissing and see the water coming out of the tofu as it cooks. Turn the tofu triangles over and dry fry the other side, pressing down with the spatula and cooking until golden brown. Remove the tofu from the pan. It is now ready to use in your recipe. Dry fried tofu will take on the flavors of your sauce without having the mushy texture that many people don't enjoy. Add the dry fried tofu to a sauce or to a marinade and allow it to sit for 30 minutes to absorb the flavors. You can then use it in your dish, or add it to a stir-fry or dish without the soaking step if the recipe gives it time to take up the flavors. It will depend on the dish and your personal taste. You can store the dry fried tofu in the refrigerator if you are not going to use it immediately. It can simply be wrapped or placed in a storage container.